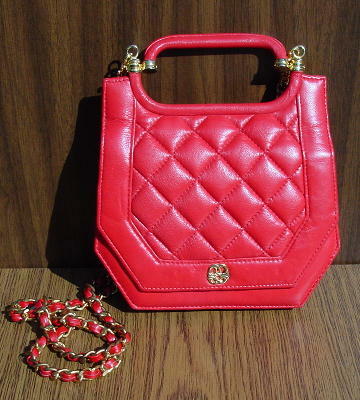 This red Italian leather purse has quilted front and rear flaps with magnetic closures. 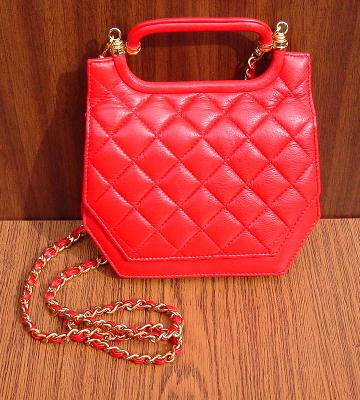 It has a leather and metal 45" shoulder strap that can be detached so you can carry it by its cute little handle. The front and rear compartments are lined in red leather, and the front has an interior zipper pocket. There is a gold-tone ornament on the front flap. It was used in a catalogue photo shoot.